A mini-episode if you will, spreading the word about Hatopia a limited edition by Woolly Wormhead. 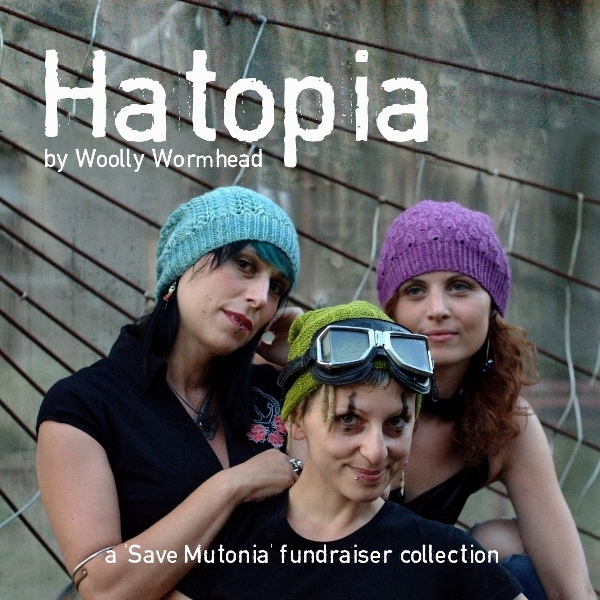 Full details about the collection can be found at http://www.woollywormhead.com/hatopia/ . Snatching a moment to speak to you all between filling a skip and trying to get on top of the ironing! This episode is accompanied by spinning on the Traddy. I’ve cast on a Liesl in an early handspun, but not got very far with it. I’ve knit two cowls as a test knit for Knit.Spin.Cake (details here and here). I’ve also cast on another test knit, a sock with travelling cables (no Rav notes yet). I’ve also bought some Sublime merino DK in raspberry pink to crochet a Dorothy. Currently I’m spinning a rainbow braid bought ages ago from Krafty Koala on the Joy and a large carded batt of grey Jacob from Shearer Girl Yarns. In 67 minutes I got quite lot! I bought yarns from the Knitting Goddess, fibre from Fluff’n’Stuff, LongdrawJames, Shearer Girl Yarns and The Wool Room, some throwsters’ waste, some Knitpro Karbonz and some mill-soiled undyed sockyarn from Texere. I also bought a new spindle from Spin City UK. We went to Highclere Castle – great for Downton Abbey fans! Podcasts – this episode I talk about a newer podcast, Stitched Together and an old favourite, CogKNITive. Bakewell Wool Gathering, 19-20th October 2013, Bakewell. We have a listeners’ map. Please go on over to pop in a pin – we’re covering 5 continents now but I’d still love to see where you all are! Please feel free to leave a comment here or at http://www.yarnsfromtheplain.blogspot.com/, or email me at yarnsfromtheplain AT googlemail DOT com. We have a Ravelry group here, so come on over to chat. You can find me on Ravelry as talesfromtheplain and on Twitter as talesfromplain (although Tweeting can be sporadic! ).